 In this challenging, provocative, and original multi- disciplinary study, Mengham (English/Cambridge) goes beyond linguistics, semantics, and philology, to consider language in the evolution of social life, from its mystical role in religion to its historical one in culture and its material one in economics. Mengham starts with an insightful analysis of the symbolism of Babel, the diversity and variety of languages, the special qualities of literary and even schizophrenic language, concluding that Babel represented a fortunate fall indeed. 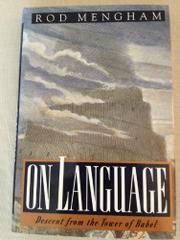 The shadow of Babel, representing primitive and unified language, hovers over the entire book. Mengham's primary interest is written language: its origins, variety, divergence from spoken language, spiritual and political significance, and its utility in preserving culture, carrying ideology, and extending power into alien cultures. He observes, for example, how the power of Paul's universal Greek helped Christianity overcome the Essenes, who used the dying Hebrew and Aramaic in the Dead Sea Scrolls. He offers grammars, lexicons, and dictionaries as expressions of universal authority in language, overcome by the differentiated language of class, nationality, and gender that arose during the age of revolutions in the 19th century. Among the most interesting and original observations are the parallels he draws between the history of language and the history of coinage; they occasion a chapter on the language of distribution, which parallels an earlier chapter on the distribution of language. His conclusion points up the dangers presented by the standardization of language in commercials and by the various processes of mechanization such as computers, an impoverishment of language resembling the form before Babel. With rich allusions to myth, superstition, religion, anthropology, a challenging and rewarding book, well worth the stretch it requires.